Since I find bees very cuddling and always wanted to live in a beehouse, I jsut made my dreams come true. 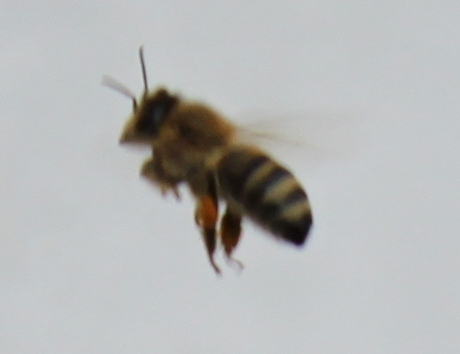 However, the bees have moved into my house - and not the other way around. I have located two hives in the attic. 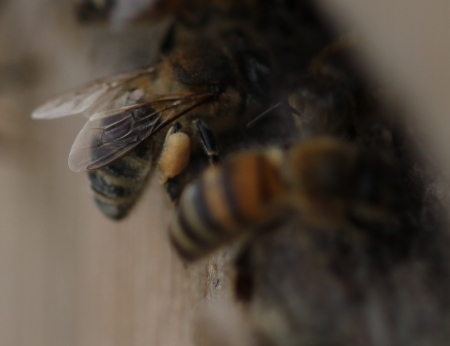 Through an entrance hole in the wall the bees have access to the outside. The attic is directly above my bedroom - separated by only a relatively thin wooden floor. 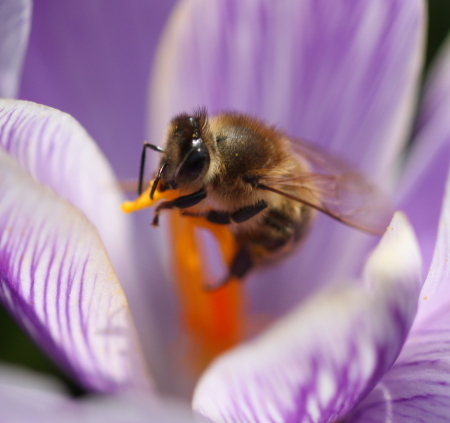 I can hear the bees peacefully humming at night. At three or four clock in the morning I hear some sort of a "conversation", because they are a little louder. 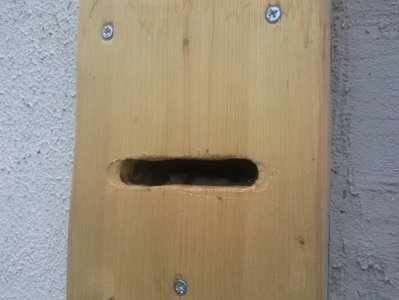 It's like sleeping in a beehouse! 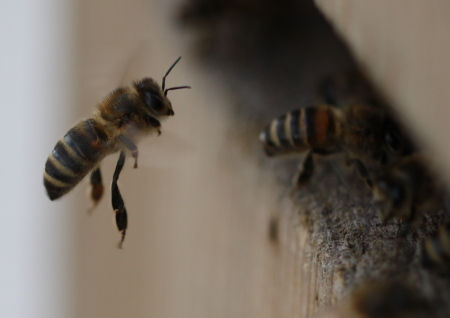 In addition, the entrances are directly above the bedroom window, so I hear and watch the first bees fly out in the morning and the last ones return home in the evening. 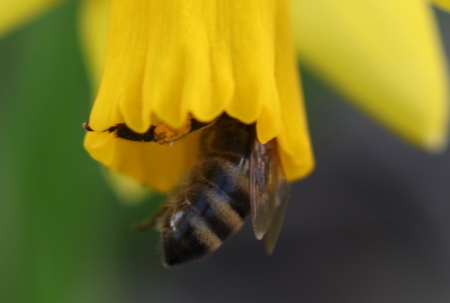 It's nice to be so close to the bees and live in a "bee-house". 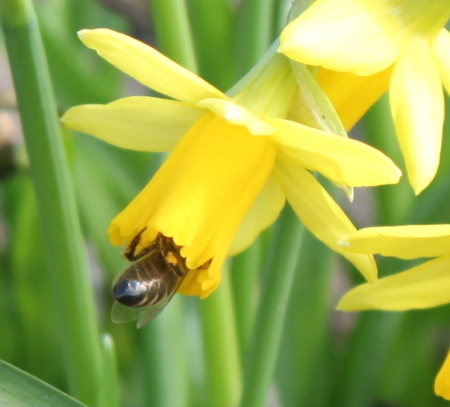 The bees like the lofty height apparently. 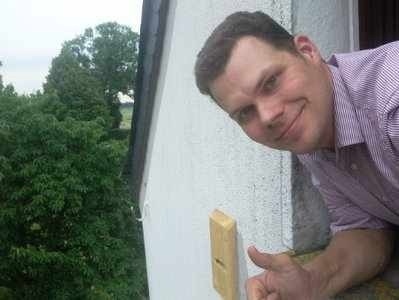 I like to lean out of the window and watch the bees shoot out in a straight line from the entrance hole. 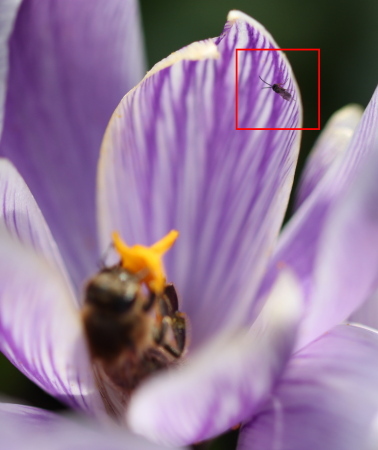 Due to the free view I can follow which direction the bees take. View from outside. 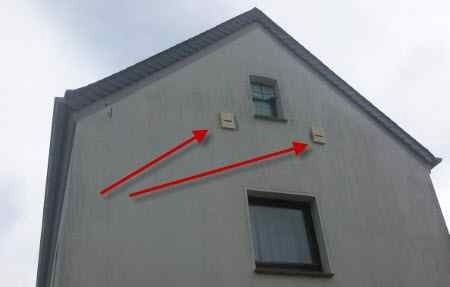 The red arrows point to the entrances. View from the inside. Left and right of the window the Warré hives. 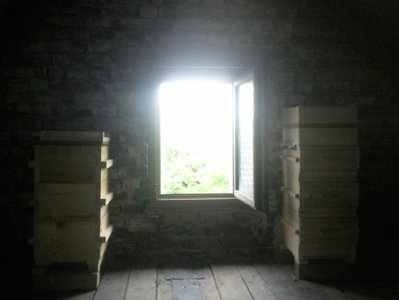 When I open the hives, the bees fly into the light out of the windows and return to the hive through the entrance. Observation from a different point of view! I have build holes into the wall and in front of it wooden boards with a slit as an entrance. I want to paint it and still looking for a nice theme. 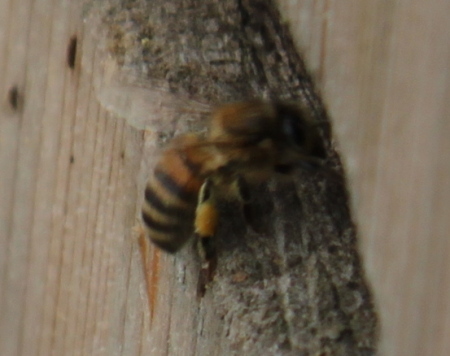 The bees doing very well. I connected the floors beetight to the entrance. For this I also used a wooden board inside fastened with dowels, and all around smeared with mortar. 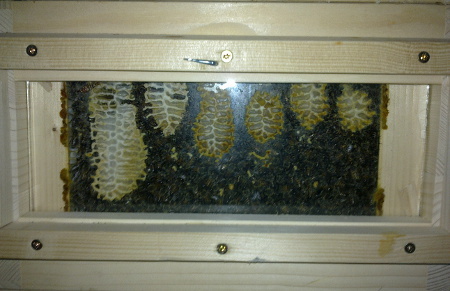 Through the lowest hive window I can see from the back through the entrance to the outside. 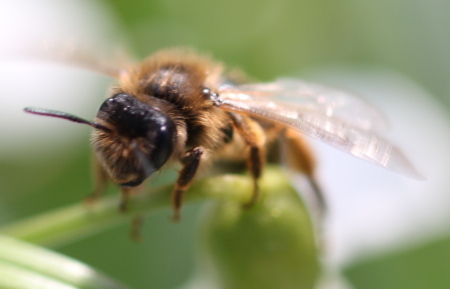 The corridor is well protected by guard bees - it looks, as this can be well defended! 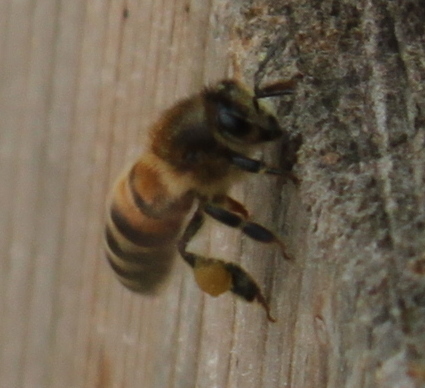 The industrious bees establish their apartment - I saw eggs in the outer comb. Beautiful wax discs grow down there. 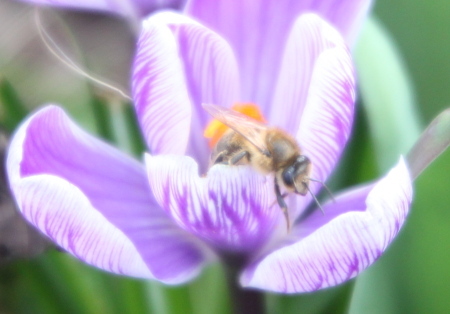 Greetings - buzzing in my sleep! Very cool!! 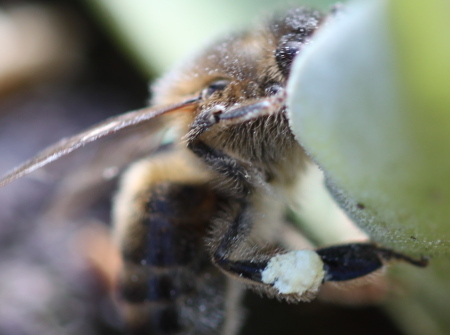 It also answers my question about what happens when you open the hive. 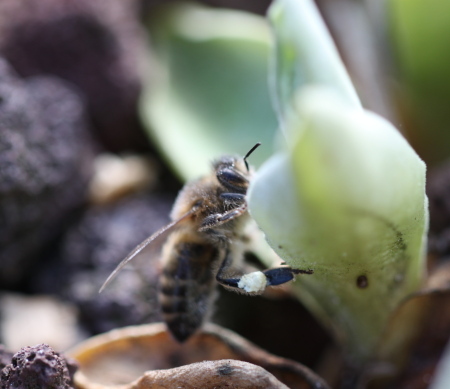 Doing my best to keep bees alive and healthy since May of 2011. Posted: Tue Jun 07, 2011 12:55 pm Post subject: Wonderful! That's great, Bernhard. 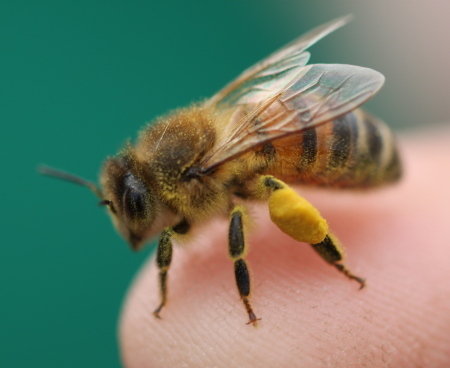 I may evict my family and move in some bees. Very nice idea! 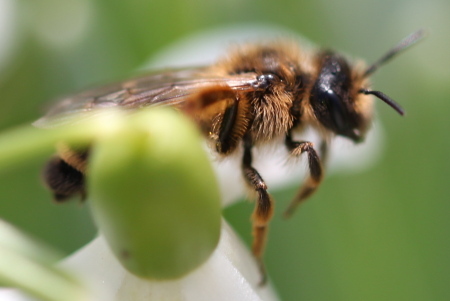 I'm thinking very good for the bees as well. Stable environment and no chance of large predators or vandalism. Yes, we do have severe cold winter winds here in the flat lands. At least the hives are protected from the wind (and inspectors ). We don't have a TV, you know. An observation hive would be a good alternative. That's great!! I wish I could do that, but our attic gets way too hot in the summer. Thank you for sharing the set up and pictures! It's 1:24 am in the morning - again the humming of the bees rises a bit louder (what I described as conversation before). 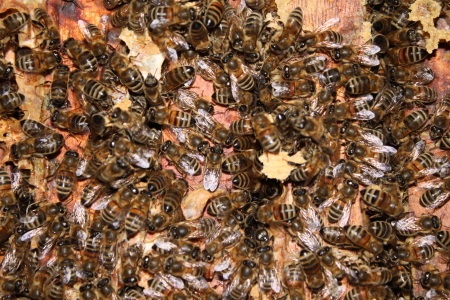 It is only one hive. The humming still is satisfied, just more intense. The hard part would be convincing the wife I think, after that it's just carpentry. I would think an acrylic aquarium might be a good starting point for a top bar style hive. Easier to work with than glass and less likely to break. Not terribly sure how you would open it without filling your living room with bees though. Excellent set up Bernhard - I like it. 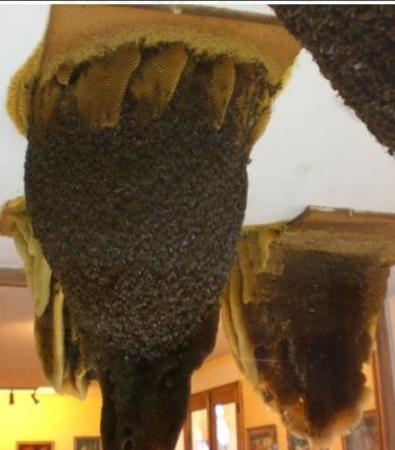 Not terribly sure how you would open it without filling your living room with bees though. 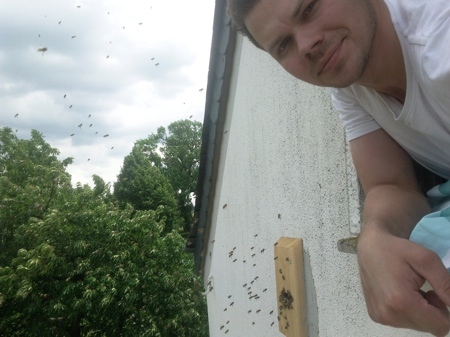 Could be a great way of getting rid of unwanted visitors though - "Have you seen my bees? ......"
You won't open the hive every week, I suppose. So that maybe Ok. 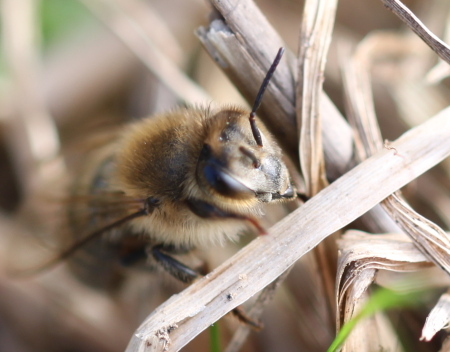 Anyway there only are few bees coming out, if you don't touch the brood nest. 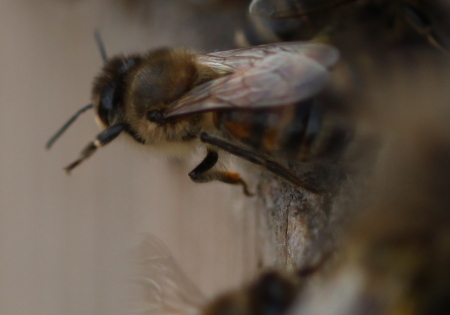 Since the living room is on ground level, I also think about a door from the outside to access the bee hive. We'll see! This way you watch the colony as a whole. I find this sight spectacular beautiful and a must have accessory for the living room. Other people have aquariums in the living room, so why not? The only thing that worries me is the outside/inside temperature difference. Well, it needs time anyway, so in a couple of years ideas will ripe. Those exposed combs are just awesome. What is the background on those? If I remember right, those colonies can be found in a Spanish (?) beekeeping museum for education purposes. The colonies start in a box. Once the comb is attached to the lid, the lid goes up and fixed at the ceiling. I'd like to visit that museum! Pretty neat Bernhard!! Thanks for sharing. Do thoes have glass around them? Do you have a wider shot? Great idea if you can persude your wife. Who needs TV with those cubesin the front room? Have you thought about making the cubes from double glazed sealed units with the air space between filled with argon. This will dramatically reduce heat transfer either way. They will of course be very heavy. Bernhard,thank you for sharing this with us. 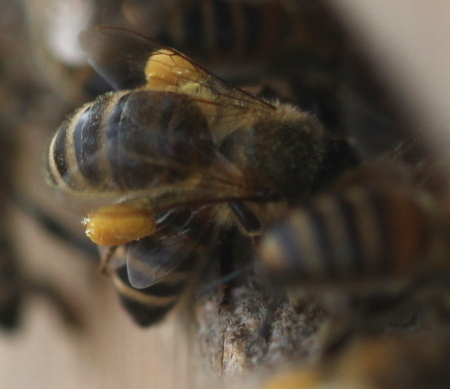 It must be a wonderful experience to lie awake at night listening to the contented buzz from the hive in the attic. When I have enough experience I would hope to do something similar. 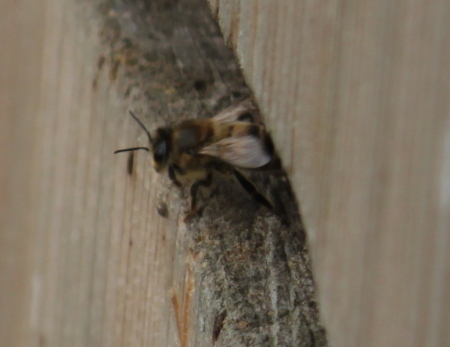 It would be an ideal way to keep the hive out of site while at the same time keeping the bees flight path way above the heads of my neighbours. i'd love to do the same, but i know in my attic in summer, you could cook stuff up there so hot!!! A short update on the bee house from last weekend. 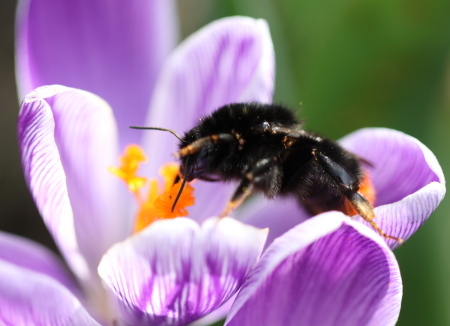 The bees used the sunny day to get outside after a series of cold rainy days. The picture is in the morning (no flight), while the video was shot in the afternoon. 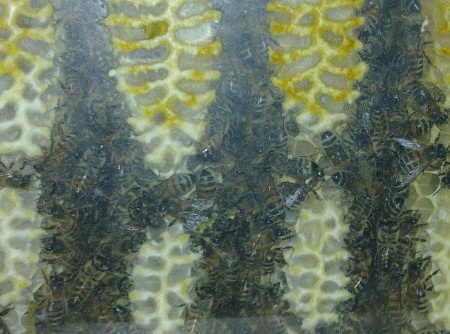 The picture shows how densely packed with bees the hive is. 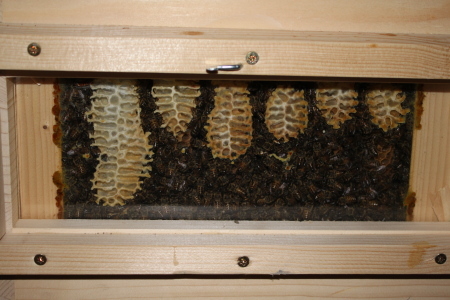 That is the way it should be and is a result of downsizing the hive to two boxes. Temperatures go down to 5 degree Celsius at nighttime (outside temperatures), while in the attic it is 12 degree Celsius. 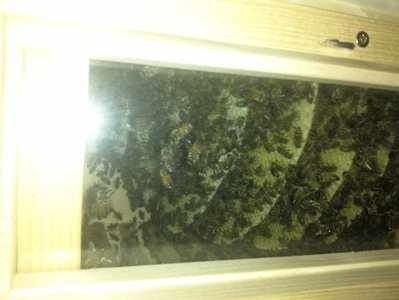 Because the bees are in contact with the outside through the entrance, they probably feel a lot colder as the attic temperature might implicate. 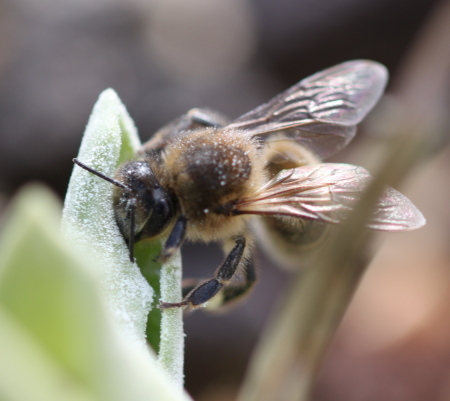 At least the bees are very calm when clustering, and they cluster, which let me think, they feel the cold outside more than the inside temperatures. Very cool! Thanks for the update. 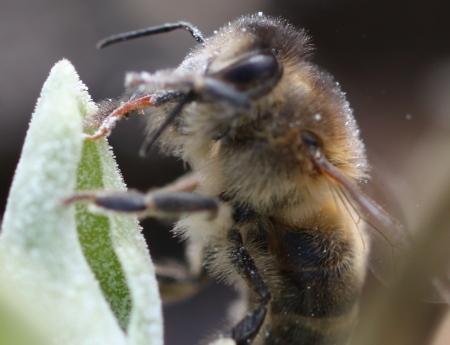 Did you gather any honey from them? Notice any difference? 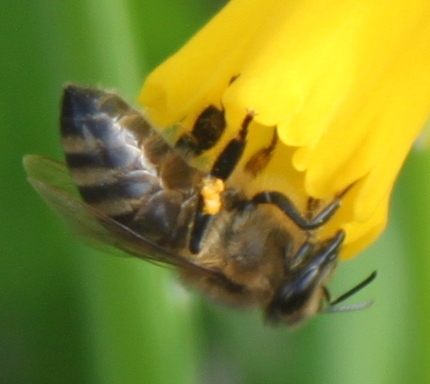 I harvest just as much honey as I need for my own consumption, so I left the stores of the two untouched this year. 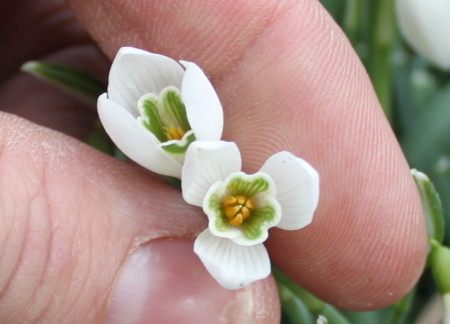 There are little differences to other colonies outside the house. The entrance is deeper, like a tunnel. 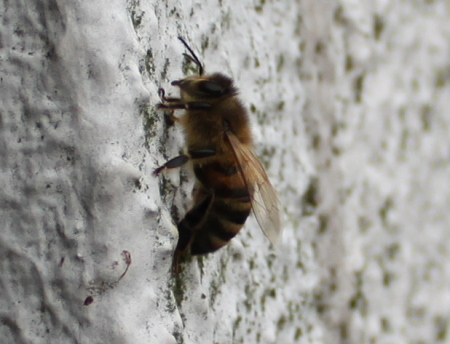 The bees need to crawl about 30 cm through the brick wall into the hive. 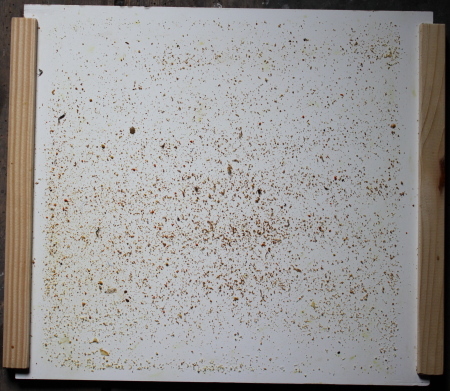 It seems that wasps have no chance at all to get into or through the tunnel, because that passage is filled with bees. I didn't need to reduce the entrance yet. 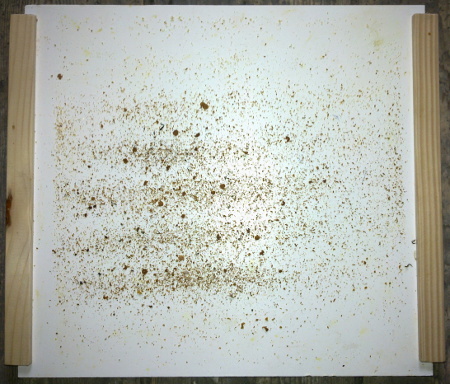 Flight activity and clustering also is similiar to other hives. So I observed no real differences yet. 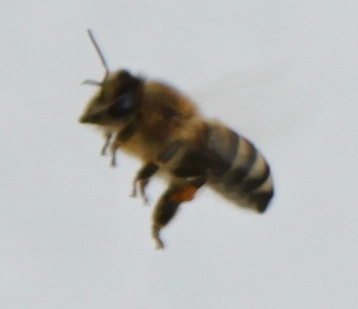 To now there is a constant bee flight almost every day. Just a series of three-four days with no activity. Scary! Even in rain the bees peek out between rain showers. 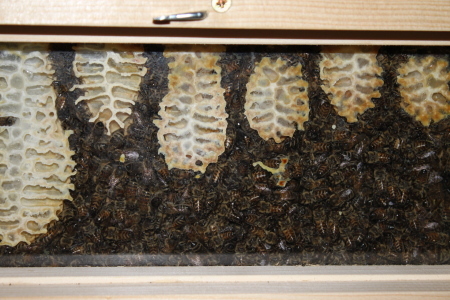 The hive box is packed with bees. The floor doesn't show any alarming. 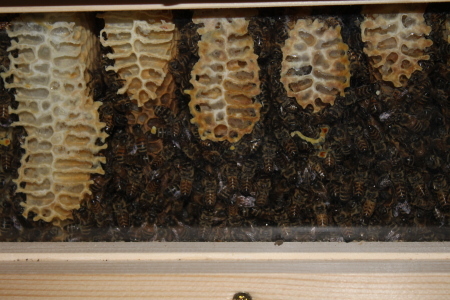 Three combs of brood already. 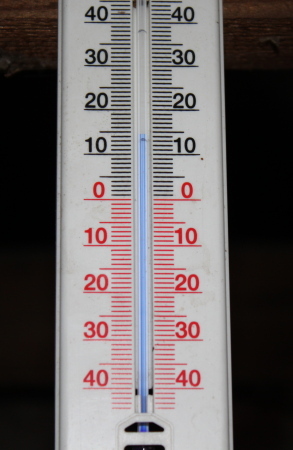 Today it has been 8°C outside and in the attic it was 15°C. 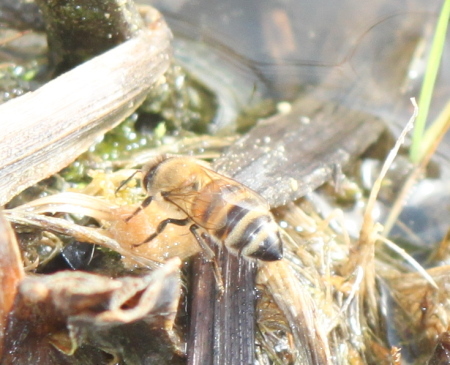 The bees went out and collected water. I checked the stores. 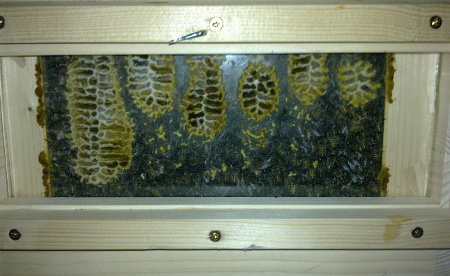 Through the windows the combs appeared empty, so I opened up the hive. Stores were all good. 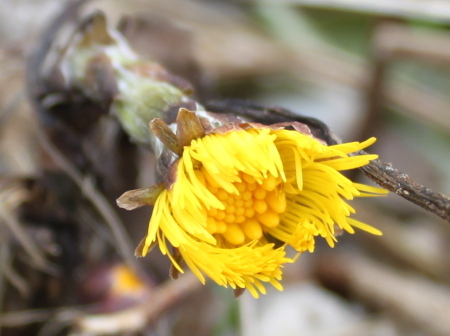 Phenological Pre-Spring just has started with coltsfoot and snowdrop blooming. 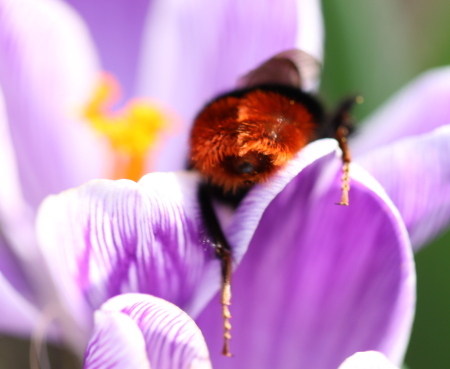 Today it has been 12°C and the bees were out. Flying like crazy. Within the hive the cluster is loose and the bees walk all over the hive, even to distant combs and open honey cells, relocating the honey closer to where the broodnest is. 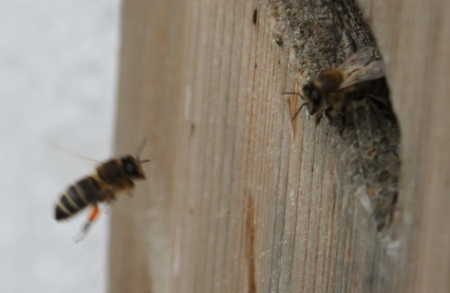 I saw bees dancing, short distance dances, vibrating and such. 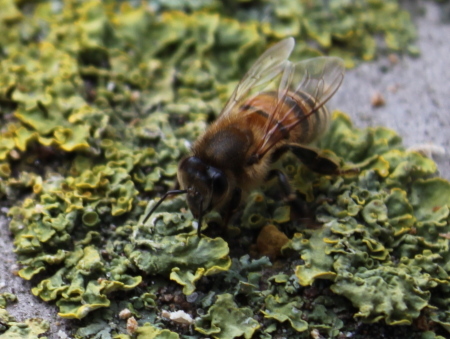 On the floor there are many pollen, some in very bright colors. 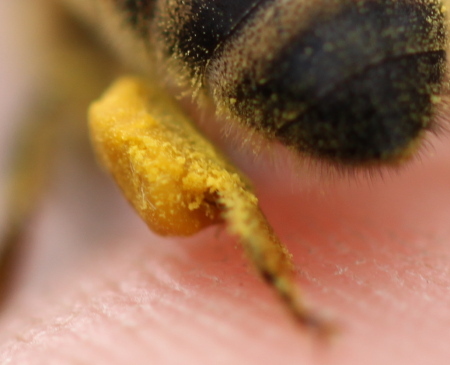 0-1 mites fall per week. You also see the debris from the cell caps. Ready to take off into the blue sky! The Forsythia is blossoming, which is the first sign vor "Prime Spring" how we call it. 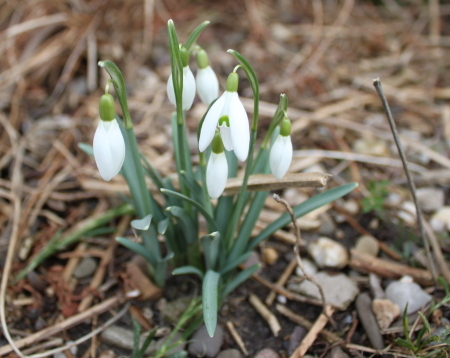 (Erstfrühling.) Gooseberry is getting first leaves as well. 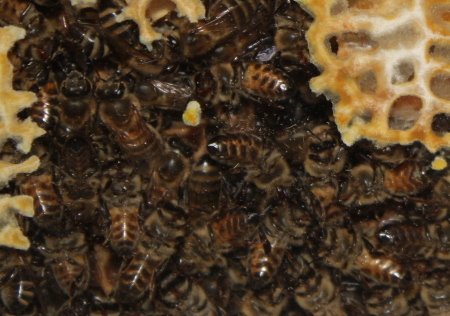 In the hive all are very busy. 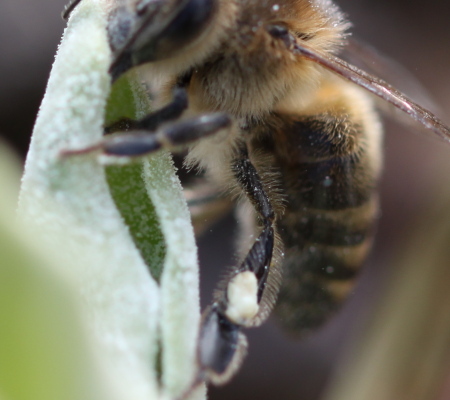 The bees dance a lot. 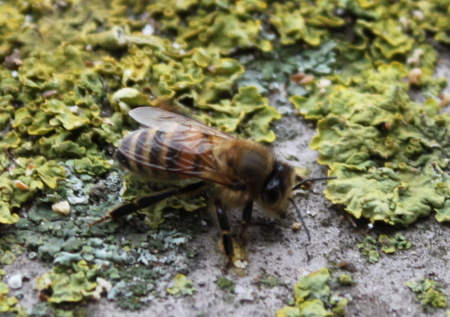 Of course some of the old bees die in those days - you find them in the front of the hive. 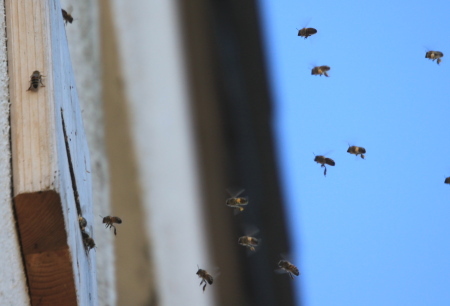 Some bees fanning at the entrance - moving the winter stale air out? 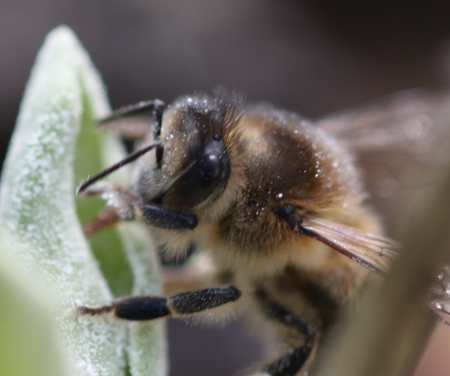 Freaky as well - this bee collects hair from a Primula auricula's leaves. Here she wipes her faces and put the hair into the pockets. Who's that hanging in here?! 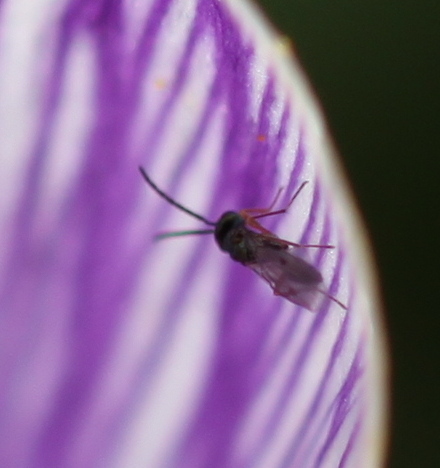 Zoom in: A sort of mini-wasp. Didn't see what kind of.